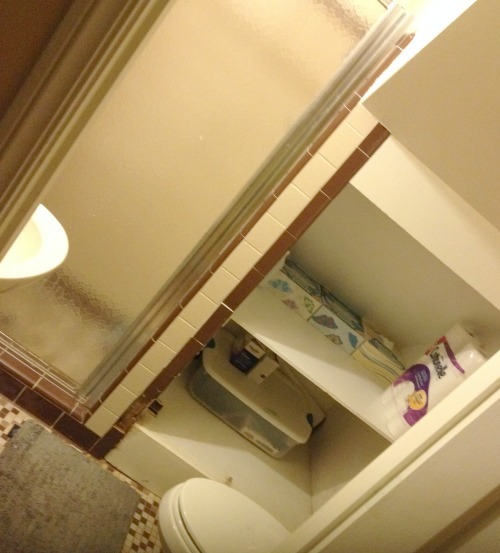 In my welcome post I mentioned our house has three full bathrooms, all with wall-to-wall tile. I’m trying to focus on our downstairs bathroom, which is the one that gets the most use. Any guests that visit use that bathroom too. 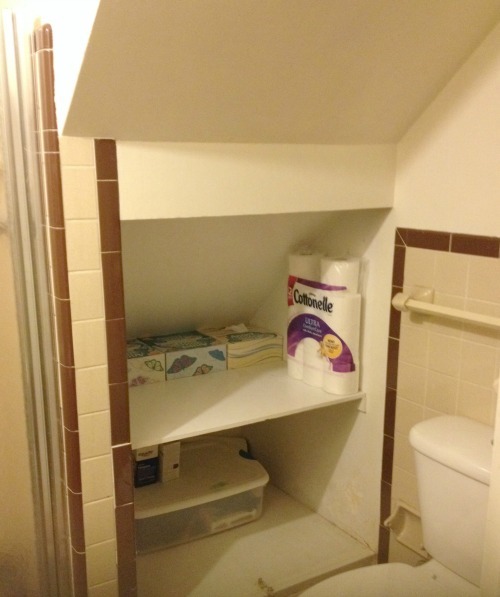 – It’s a tiny, under-the-stairs bathroom. – The tile is 3 (three!!) different shades of brown. – Basically, it’s ugly. Like, 1970’s embarrassingly ugly. 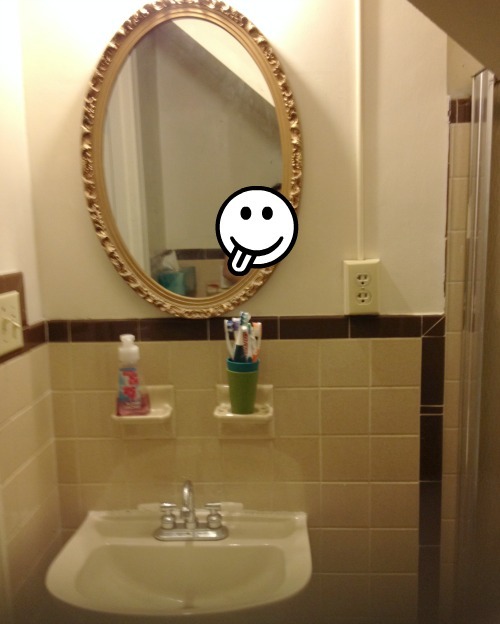 – The tile is in good shape except for one spot on the wall near the shower. 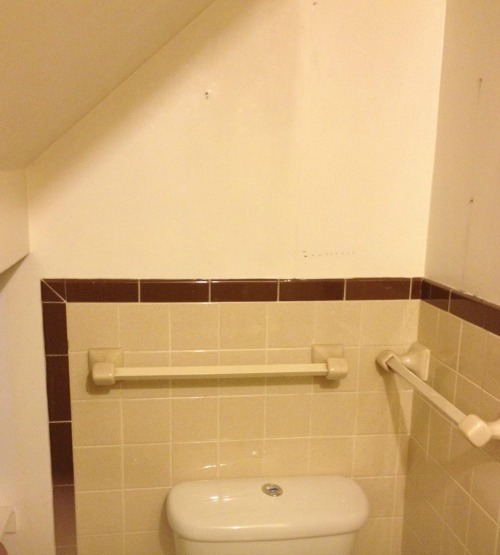 – We replaced the toilet, so that’s new. – There are no leaks that I’m aware of? Okay, now I’m stretching to find the positive! In short, it needs a makeover. It’s about 20 years overdue 😉 Just as a warning before you look at these pictures. There is no natural light in this room and my photography skills are pretty much ZERO. I’m working on it though. My thoughts always go to decorating first but there has to be some other things done first. I’d like to either cover the tile with PVC Beadboard like this sold at Lowe’s or paint all of the tile with Rustoleum Tub & Tile Kit. We have also considered taking the shower door off to open the space up a bit. The problem with that is my 10 year old son uses that shower every day. He isn’t super careful with the water. Not sure if he’d be able to contain it even with a curtain liner up. The shower door also hits the sink if you try to open it all the way. The pedestal sink is an almond color plus it has a big crack on the side, not sure what’s up with that. So, we need to get a new sink. I’d like this smaller model from Ikea. It’s a great price and a space saver! The shelves also need to be redone. We’ve already bought a new vent fan for the space. This one is old and inefficient. Plus, it sounds like it’s readying for take off when you turn it on. The light is TERRIBLE. 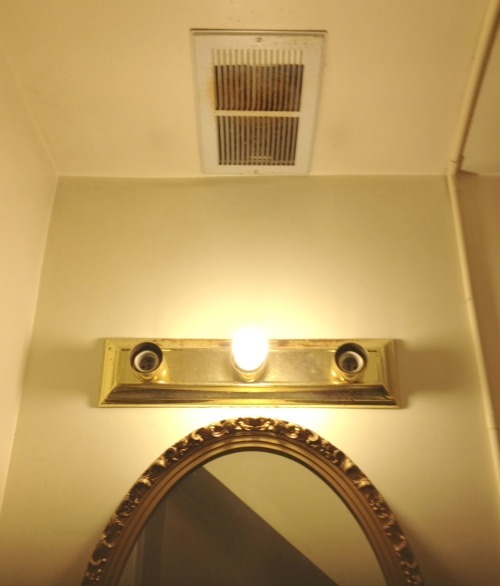 We only have one bulb in because, um, who wants to see the whole ugly mess bathed in light? Not me. I want to follow a sort of Industrial/Aero/Nautical theme. We love the look plus we love the beach. We go to Nags Head/Kitty Hawk/Kill Devil Hills every September so I thought incorporating the blueprints from the Wright Brother’s planes into the room would be fun. Here’s the inspiration board I put together for the room. In it you can see all of my choices. The paint color is Driftwood Gray by Martha Stewart. I have it in the living room too. It’s grey and blue, depending on the light. Love the inspiration board! I’m slowly working on updating our rental bathroom too but we also might buy our first place really soon so I’ll be able to get my hands dirty!! Good luck! Can’t wait to see it finished! Thanks for the luck! Buying your first place, that’s super exciting!